If you had to pick one of these giant midstream companies, would it be Canada's Enbridge or Kinder Morgan? Investing is a trade-off between risk and reward. If you're comparing Enbridge (NYSE:ENB) and its nearly 7% yield against Kinder Morgan (NYSE:KMI) and its 4.8% yield, as well as its robust dividend growth prospects, risk is the part of the equation to watch. Here's a quick look at these two high-yield stocks and why one is probably a better option. Enbridge is a large Canadian-based midstream company with a corporate structure that looks something like an octopus today. That's because the parent company, Enbridge, has historically grown by using controlled entities like limited partnerships. The relatively recent acquisition of Spectra Energy, meanwhile, added yet another partnership to the fold. The problem is that regulatory changes in the partnership space have made these entities less desirable funding sources. So, Enbridge has embarked on a simplification plan. Effectively, Enbridge is buying all of the controlled entities under the Enbridge umbrella so it will, after all is said and done, be one single company. As it is doing this, however, Enbridge is also repositioning its portfolio around regulated and fee-based assets, a move that requires selling billions of dollars' worth of businesses. Those asset sales should help the company further one of its other goals: debt reduction. And, as if that weren't enough, management continues to back its dividend growth goal of 10% annual hikes through 2020. This is not a set-it-and-forget-it type of investment. If you are looking for a boring stock, you'd be better off elsewhere. That said, Enbridge appears to be executing well on its plans. Asset sales are moving along nicely. Long-term debt has fallen by around 3.5% through the first nine months of the year. It has agreements in place with its controlled entities that suggest the simplification plan is bearing fruit. The company just announced a 10% dividend increase for 2019, and continues to execute on internal growth projects. And finally, it's projecting that full-year 2018 distributable cash flow will fall toward the high end of its projected range, and just backed its 2019 and 2020 guidance. In short, there are a lot of moving parts, but Enbridge is following through on what it said it would do. For income investors willing to actively watch their investments, this midstream company could be a good portfolio addition. The fact that Enbridge is executing well on its stated plans is no small issue. In fact, it's essentially the main reason investors would be better off avoiding Kinder Morgan. You have to trust in the leadership running the companies in which you've placed your money, but that's not something you can easily do with Kinder Morgan. This isn't because Kinder Morgan is a bad midstream operator. That's not the case at all. After all, it's one of the largest and best-run companies in the space. Also, the company's dividend growth plans are pretty enticing, with a goal to increase the disbursement by 25% in 2019 and 2020. That puts Enbridge's planned 10% hikes to shame. But here's the fly in the ointment: Kinder Morgan's increases are coming after a massive 75% dividend cut in 2016. 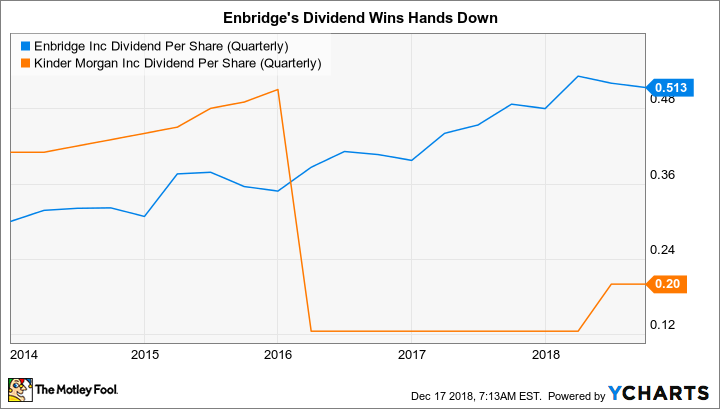 Enbridge has more than two decades of annual dividend increases behind it. But here's the bigger problem: On Oct. 21, 2015, Kinder Morgan announced an increase that pushed the dividend up 15% year over year. In the news release, it said, "As a company, we remain focused on our goals to continue to return cash to our shareholders in increasing amounts, to maintain our investment grade ratings and leverage targets while funding our business in the most efficient and economical way possible." Its first goal listed, returning cash to shareholders, was backed by the comment that "while we are at the beginning of our budget process for 2016, we currently expect to increase our declared dividend for 2016 by 6 to 10 percent over the 2015 declared dividend of $2.00 per share." The company added that "this range will provide the flexibility for us to meet our dividend and have excess cash coverage." On Dec. 4, less than two months later, the company announced that "KMI has now completed its 2016 budget process and expects to generate 2016 distributable cash flow of slightly over $5 billion, which would be sufficient to support dividend growth in the range discussed in the third quarter call. Alternatively, this cash flow can be used to fund some or all of KMI's equity needs for 2016." Four days later, on Dec. 8, Kinder Morgan announced the 75% dividend cut. To be fair, management made a hard choice between supporting the dividend or funding growth projects at a time when capital was tight. It probably made the right call for the company, but it was a painful hit for income investors who had trusted their word that dividend increases would continue. ENB dividend per share (quarterly) data by YCharts. Some might protest that this history lesson is no longer relevant to today. However, Kinder Morgan had another setback recently that again showed investors that they may not be top of mind. In mid-2017, Kinder Morgan spun off Kinder Morgan Canada (NASDAQOTH:KMLGF) to own a collection of midstream assets and a multibillion-dollar Canadian growth project. Kinder Morgan owns roughly 70% of Kinder Morgan Canada. The big growth project hit a snag with local governments and residents and was ultimately sold to Canada's central government for 4.5 billion Canadian dollars. That left Kinder Morgan Canada with a huge cash hoard and severely reduced growth prospects. Kinder Morgan, looking to get its hands on that cash, voted through a massive dividend at Kinder Morgan Canada. While this move benefited all of Kinder Morgan Canada's shareholders, it left the Canadian company without material growth prospects and without cash that it could have used to fund acquisitions and growth spending. Though this was probably the right move for Kinder Morgan, it was perhaps not the best option for Kinder Morgan Canada or its other shareholders. Once again, Kinder Morgan, Inc. came first. Kinder Morgan is a giant in the midstream space with a long history of running its assets very well. However, the recent past has shown that shareholders may not be as high a priority to Kinder Morgan as investors might like. Trust, in other words, is a very big concern here. With that in mind, Enbridge is a much better option for income investors. It has a higher yield today, is offering solid dividend growth prospects, and, even more importantly, appears to be following through on the plans it has laid out to shareholders. That's no guarantee of the future, but it's better to bet on a company that's living up to its promises than one that has a history of falling short on them.